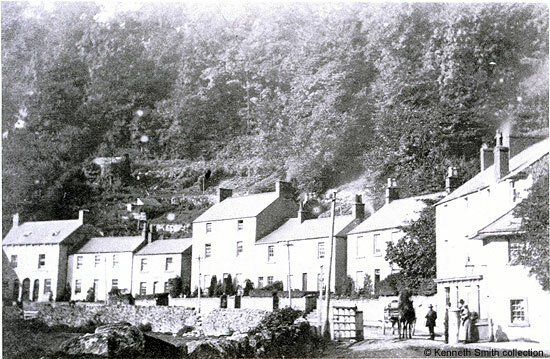 On the main road running through Matlock Bath were two toll bars, one at the southern end of the village and this one at the northern end below High Tor at Artists' Corner. You can see the open gate which, when closed, would prevent vehicles or people from passing through without paying a fee to reach their destination. Several nineteenth century guide books describe the scene at the time. "Gem of the Peak", for example, talks of "Fox's lodging house beside the toll bar". The toll house in the Dale replaced the toll house at Holt Lane. The task of toll keeper or collector wasn't always undertaken by men. In 1841 Elizabeth Knowles was the toll bar keeper here and thirty years later the job was being carried out by another woman, Mary Greatorex of Common Wood. In between then Mr. and Mrs. Phillips collected the fee at "Matlock Bridge Gate". They were followed by the Dunns. The open space on the opposite side of the road is a car park these days, but in the mid twentieth century it was more of a park. Visitors would buy trays of tea from Wilson's shop and carry them across to the park where they would sit and enjoy the view. Life was full of simple pleasures! In some respects the scene has changed very little over the last one hundred plus years. Incidentally, the shadow cast by the coach house belonging to Tor Cottage is visible on the house on the far left. Original photograph iin the collection of and provided by and © Ken Smith. Scanned for this website and information written, researched by and © Ann Andrews. Research undertaken by Colin Goodwyn at Matlock RO has found a specification drawn up during or soon after 1831 for pulling down the toll house 'near the Boat House Inn' and rebuilding it 'at a place appointed by Peter Walthall esq'. Neither of the two copies of this spec. are endorsed and it's probable that the work wasn't proceeded with but there is another spec. for pulling down the old toll house 'at Holt Lane' and erecting a new one 'between the house of - Collingwood esq and the house belonging to Mr Chinery', i.e. between Tor Cottage and Dale Cottage. This work was accepted by Joseph Watts on 18 July 1833 who undertook to complete it by 11 September 1833. The building is on the deposited plans for the Manchester, Buxton & Matlock Railway for 1845. William Phillips, with his wife Jamina supporting him, were listed in the Dale in the 1851 census return.